Welcome to C&W Echinox’ 2nd edition of the “Bucharest Premium Residential Market” report that analyses the premium market of new residential units located in the central northern part of Bucharest.In the last few years, the stable economic and political environment, sustained by an increase in average monthly income, private consumption, tax cuts and a decrease in unemployment rate, contributed to the real estate market evolution on all segments, including the premium residential sector. 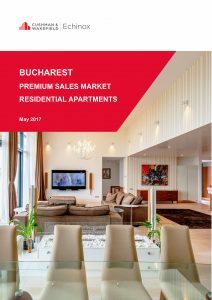 In 2016, the most active areas in terms of premium residential development were Kiseleff and Aviatorilor, each comprising of 35% share out of the number of units completed across Bucharest’s premium locations in central-north. More than 1,000 premium residential units are currently under construction and planned for delivery in the next two years, out of which 40% have been already transacted. The most active areas in terms of construction works are Floreasca and Herastrau. Given that the northern area of Bucharest has become an important office destination, the investors’ confidence and appetite for developing premium residential units is set to follow the same positive trend. Their intention is highlighted also by the fact that a series of land plots were recently transacted in the central and northern part of the city.